So you're wondering, “How long do resin rings last for?” and “How durable are resin rings?” (The second I’ll answer in the FAQ at the bottom of this post, and in this post I’ll go in-depth with the first question). I have never personally owned a completely resin-made ring. I've only worn my own rings, which are a mix of metal and resin. But having worked with epoxy resin for years, I can still totally answer this commonly-asked question. The short answer is: with proper care--probably a loooong time. This is a difficult thing to tell when buying jewelry, but it is an important factor. Some resins are made more for doming and some are made more for molds (the manufacturer will say so in the description of the resin, but often a jewelry maker won't be mentioning this). But, different brands of resin also have varying degrees of yellowing from UV rays. Some brands yellow quickly and easily. Some resist yellowing, even when exposed to UV rays for long periods of time. ArtResin is geared towards doming (though it can be used for molds) and lasts longer than other brands without yellowing. Click here to learn more about why I use ArtResin. There's costume jewelry and there's fine jewelry. Non-precious metals and plated jewelry. Non-precious metals are copper, brass, stainless steel, etc. Plated jewelry has a base metal, actually an amalgam of cheap metals, usually a dark grey or a brassy red. The plating is only one thin layer. Some plated jewelry can last quite long if coated in an enamel. Kendra Scott does this with their regular jewelry (they also have fine jewelry), and I have a pair of earrings years old that still looks good (got a pair on sale for $35, if you’re wondering). It’s not a common experience with plated—but some jewelry know how to do it right. But, once that enamel goes away and the plating wears off, there is no way to ring the piece back to it's original shine—unless you pay to get it re-plated. In other words, plated jewelry has a limited time it'll last. Non-precious metals are not always low-quality. If you have no allergies to copper, solid copper jewelry is a great and affordable option that can be brightened up again and again. The same goes for brass, providing the jewelry is solid—not brass plated. And providing that you don't have allergies to bronze or brass. Solid gold, sterling silver, platinum, gold-filled jewelry, etc. Gold-filled jewelry is similar to plated—it won't last as long as solid gold—but it has 100 layers of gold plating, so it will later 100x longer. However, solid jewelry will always be the longest lasting option, because it will not run out of layers. Tendency to tarnish DOES NOT indicate that quality of the metal. Sterling silver will naturally tarnish to black, as copper naturally tarnishes to green. If they are solid, not plated or filled, then that tarnish can be cleaned off, revealing a shiny, new layer underneath. And cleaning is simple (read more about polishing solid metal jewelry here). Gold-filled is a popular option because solid gold is pretty darn expensive. So, gold-filled is the economic option is you want gold, and it's higher quality than gold-plated. In Short: Plated metals will last as long as that one thin layer they have. Filled metal lasts 100x longer than plated. Solid gold/ sterling silver/ solid anything will last virtually forever, because when tarnish is cleaned off it will always be beautiful underneath. Is the flora dyed or it's natural color? (It's not bad either way, but it can effect how long it lasts). This effects how long the flowers or leaves embedded in the jewelry will look the same. Thought preserved in resin, the flora will still be exposed to UV light (the sun, for instance—and unless you're a vampire and don't go outside—you’ll expose your jewelry to it). Flora kept with it's natural color will naturally fade over time with UV exposure. The color just won't be as vibrant as it once was. If the flora was dyed artificially, this isn't so much of a worry because UV exposure won't affect it. But, while un-dyed flora might not last as long as dyed, sometime's a plant's natural color is it's most beautiful. So it’s not a question of quality—artificially vs. naturally is just a matter of preference and how long you’re hoping the piece will last. Some resin rings do not have flora and have dyes and ink and metal flakes—or they might have a mix. Or some total other findings. If it's just dye, or any form of artificial color, OR a metal embedded inside—the color should last a long time if the findings aren’t affected by UV exposure. So, to re-cap. How long do resin rings last? A ring that is resin only? If it's high quality resin that resists yellowing in UV rays, then a long time. A ring that is a mixed of metal and resin? Provided again that it's high quality resin, but ALSO that it's high-quality metal—then a long time. If it's important to you to have long-lasting jewelry, make sure to take care of it. Read more on that here. And if you want to know why sterling silver is the best metal option for jewelry, especially in terms of long-term use and affordability, read my post on it here. In the end, how well you take care of it will affect the length of time it will stay in pristine condition ALONG WITH how well it was made. Solid metals can bear less care, besides polishing, but if your jewelry is plated it needs extra care to have it last half as long and then when worn off it’ll cost money to re-plate. Resin rings that don't involve metal at all have different factors to be aware of, but again with proper care it should last pretty long, almost regardless of where or who you get it from (the biggest concern being resin that yellows quickly/ plated metals fade quickly as rings—just read reviews from previous customers to get an idea of this). As I’ve said in other posts: These are good things to know, as jewelry buyers and jewelry makers. But, a beautiful piece doesn’t have to last forever. Especially if you’re paying less than $100 for it (but if it’s sterling silver, it’ll be both affordable and long-lasting ;). If you enjoy it, it doesn’t matter what it’s made of or how long it will last. Just be aware it might not be a family heirloom if you pick something with lower-quality materials. Resin is a very lightweight substance, so even huge resin rings are fairly lightweight in comparison to huge metal rings. My Skinny Statement resin rings are extremely lightweight because they're thinner than any other resin rings on the market (I'm teaching how to make these, if you're interested). All other crafters of resin jewelry have bulky, cumbersome designs that are clunky and in the way. I wanted something sleek, minimal, but still bold. That's how these were born. If you're ever unsure of how heavy a resin ring will be, just reach out to whomever you're considering ordering from. I'm always happy to answer questions, and I'm sure other handmade makers are just as willing to give you the best idea of what the jewelry will be like in person. A similar question to length of time they last—but more about how much they can handle. “Can they handle being dropped?” YES. They may look like glass, but they don’t break like glass. “What if I sit on them by accident?” Regardless of it being a resin ring, the general thing to consider is that thick rings can withstand more than thinner rings, always. But, thicker rings are also most cumbersome and less comfortable, so there’s a pay-off. Epoxy resin is a soft material, relatively. But then, so is metal! Precious metals especially. Gold and silver by themselves are way too soft for jewelry. And even when made stronger, they can be scratched and dented. They’re still delicate. Jewelry isn't often indestructible. It leans more toward delicate than durable. Rings can get bent out of shape, chains can break, gems can be cracked. The biggest worries for resin are similar to metal rings. Don't let anything too sharp near them (water, however, will not cause damage to resin where it will to metal), and try not to sit or step on them. Resin jewelry has the same basic needs of metal, so when the two are mixed into jewelry (see below for examples) then there's just a couple extra things to keep in mind for resin. Metal is exposed to flame, and with jewelry it happens quite often. Epoxy resin is exposed to flame during the hardening process, but it should never be exposed to flame or extreme heat when it's a finished piece. It can melt. Alcohol, harsh chemicals, and perfumes can also damage the smooth, shiny surface of resin. It will probably still be wearable, but not as pretty as it once was. The oils from our skin can wear down the surface of resin, too. Again, it may not totally ruin the piece, but to keep it in the best condition try to remove oils so they don't sit on the surface for long periods of time. This can be wiped off with a soft cloth. Metal jewelry shouldn't be exposed to water, because it promotes tarnishing—but a mild dish soap and warm water does remove oils completely (if the cloth isn’t doing it) from to the surface of resin. Again, sterling silver is a great option because it can withstand tarnishing—and water exposure—and always be brought back to life (read this post to learn more about why I love sterling silver above all else). In short—it’s as durable as it is thick. Same as non-resin rings. But at the end of the day, they’re all jewelry and should all be treated as delicately as possible. If you’re rough on your jewelry—hey, that’s fine. It just might not last in pristine condition for as long. Not a big deal as long you enjoyed it or even still enjoy it in it’s roughed-up state. There’s different ways. The most popular being molds, closed-bezel rings, and open-frame rings (such as these Nunn-Design options). 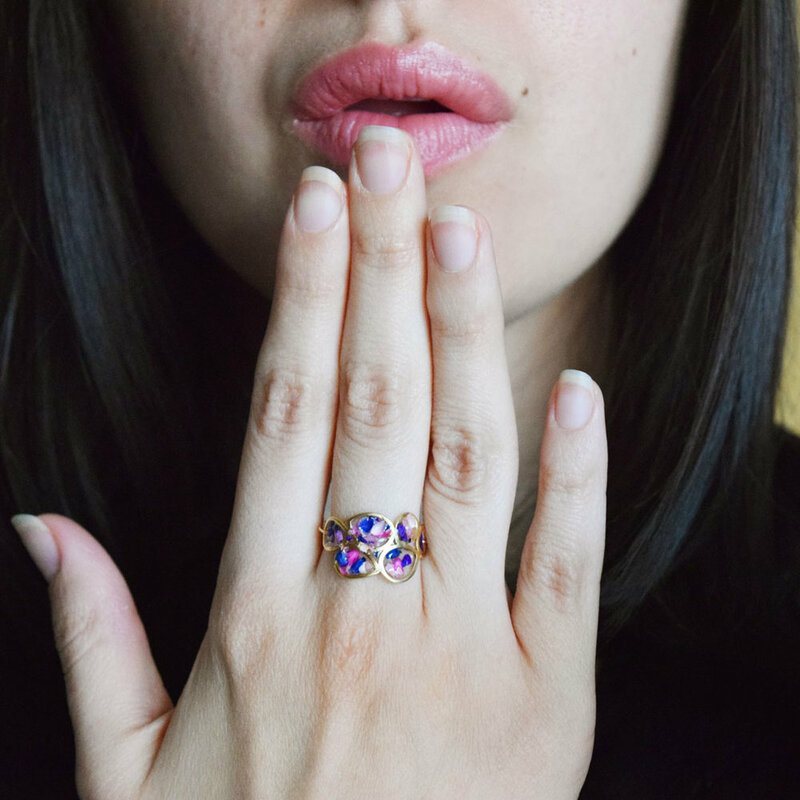 Resin ring molds can be found all over the internet—from Ebay to Etsy. I teach how to make my skinny statement rings in an online video class. No molds. No thick statement rings that push your fingers apart and are uncomfortable/ cumbersome. Click here to learn more about it.